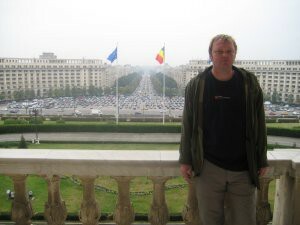 Three days in Bucharest with the India 3 and assorted others (2/2). Monument to Heroes of the Air. 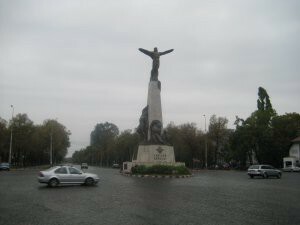 Known locally as the aviator statue, it commemorates those who gave their lives in the pursuit of flying excellence. The people who had died, up until 1935 when it was constructed, are listed on the bottom of the statue. The Arcul de Triumf, located on the Kiseleff road. 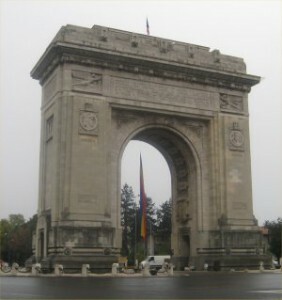 The original arch was constructed from wood, to commemorate Romania achieving independence in 1878. It was removed and another arch was put up in 1922, to commemorate the 1st world war. 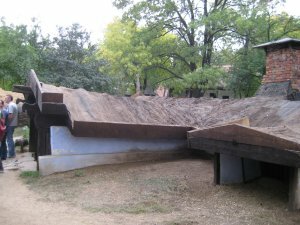 The arch in its present form was constructed in 1935 and inaugurated in 1936. It looks similar to the Arc de Triomphe in Paris but much smaller. 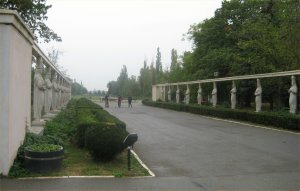 Herăstrău Park is a large park on the northern side of the City.The park has an area of about 1.1 km², of which 0.7 km² is the Herăstrău lake. Initially, the area was full of marshes, but these were drained between 1930 and 1935, and the park was opened in 1936. 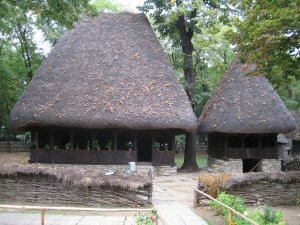 The Village Museum (which we had previously seen) is connected to the park. 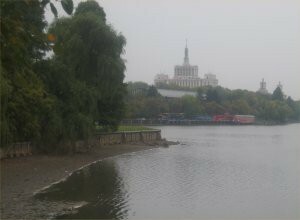 Its one of the biggest parks I have ever visited, and once featured a statue of Stalin which was torn down in 1956. 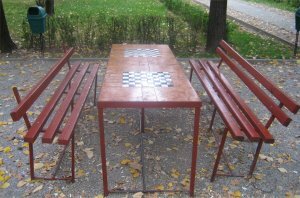 It’s a bit of a cliché about Eastern Europeans sitting in the park playing chess, but I found these tables, which prove that it does happen. 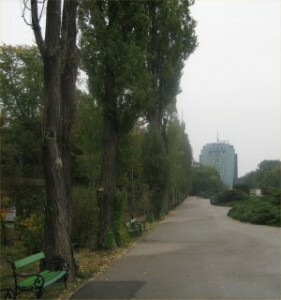 Another of the long walkways in the park. 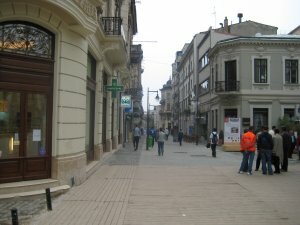 In the background is an office building in Charles De Gaul square. 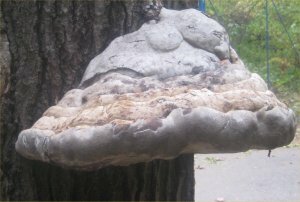 Bushcraft never leaves my life for very long, and sure enough, I found this enormous bracket fungus on the side of a tree. What surprised me was that it was still there. It was right next to the path and in the UK some fool would have knocked/smashed it off. 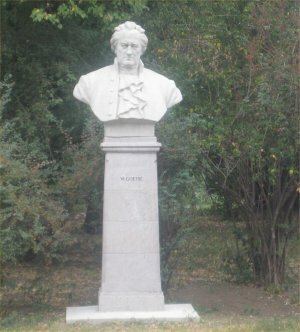 Wherever I go, I seem to find memorials to Johann Wolfgang von Goethe, one of my favourite inspirational authors. “Concerning all acts of initiative and creation, there is one elementary truth. Its what, in modern peak performance science, is sometimes called the Green Renault Megan Principle. Across the lake in the park I could see the Casa Presei Libere building in freedom-of-the-press square. I remember thinking what a daft name for a square. In my whole life, I have always been able to write to the prime minister, tell him that he is doing an awful job, that he stinks, whatever, without fear of reprisal. 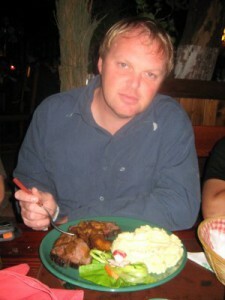 Perhaps I am guilty of not valuing something, as I have never had to go without it. I had seen most of the sights on the way there, so on my way back, I just soaked up the atmosphere. 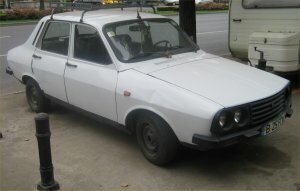 I noticed this old car. 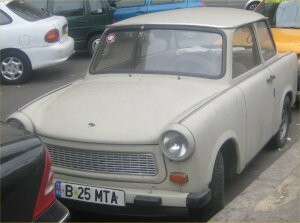 I was surprised there weren’t more cars like this, but many of the cars I saw were of a fairly modern family design. 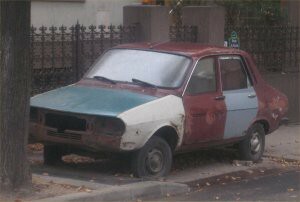 The most popular type of car appeared to be this one. They were everywhere. I remember the headmaster at my School (Mr Clayton) got one when I was 8 years old (I am 39 now). Off all the ones I saw on the way back, this one won the most knackered but drivable award. In the evening, we decide to visit a more contemporary restaurant called the City Grill, and there is talk of fillet steak. 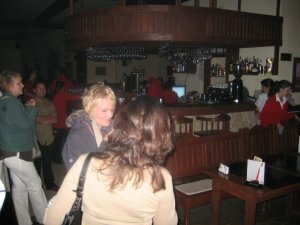 We arrive in the restaurant, and within seconds, all the lights go out (this picture was take using the flash, the people in it, are standing in total darkness). We hung around for a while, they didn’t have any candles, and advised us it might be hours before the lights came back on (it was just in the restaurant, it wasn’t a power cut) so we decided to leave. We wandered around for a while. 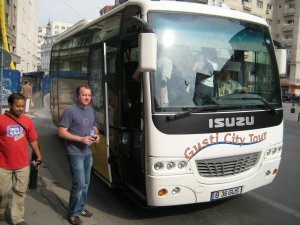 I have always believed a bigger group is safer when travelling but we hit our first problem. 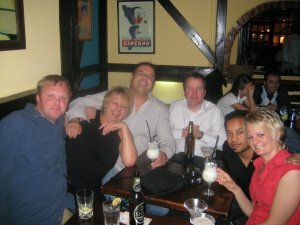 Its a lot easier for 2 people to get a table on Saturday night, than it is for 10. Luckily, we found a nice Italian and then headed back to Edgar’s, a friendly Irish bar near our hotel, which we had visited the night before. We have a minibus booked for 4pm to take us from our hotel to the airport. We decided the visit the Parliamentary Palace. Our guide had previously advised us to walk to the left hand gate. We got there and were told we had to walk to the right hand gate instead. You can see from this picture just how far that walk was. When we got there we were told to walk to the back of the building. Effectively the building, due to its immense size, cuts the city into two—an urban planner’s nightmare. Everyone knows it’s the 2nd largest building in the world, but I was told, by volume, its 10% larger than the pyramid of Ghiza. We arrive at 11:10, and find that the organised tours leave on the hour. We kill some time chatting (there was no coffee machine). We pass through security and the metal detectors (as well as a famous building, this is the home of a working government). As we set of on our tour, our guide says that we need to stay close, as there are more than 1000 rooms in the building, and its easy to get lost. 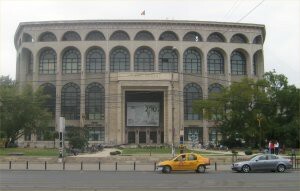 Originally named the House of the People, the building is presently called the Palace of Parliament. Moderate Communists took power after the revolution, and kept control until 2000. 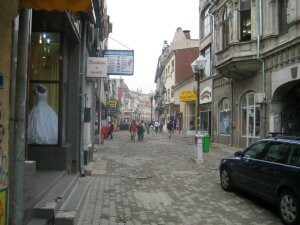 This isn’t a political site, but I was amazed when I heard that the number of crimes committed in Romania dropped by 51% between 2000 and 2004. 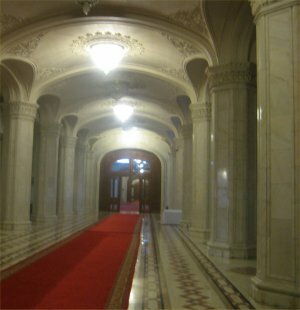 This hallway, is more than 150m long. There are 11 others just like it, on the other 12 floors. 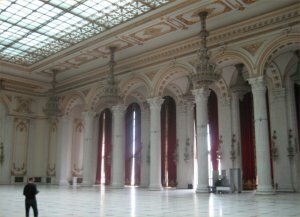 All of the state rooms are themed (this one is masterfully carved from wood, by the finest craftsmen in Romania) and can be hired for weddings, fashion shows etc. The building is constructed entirely of materials of Romanian origin. 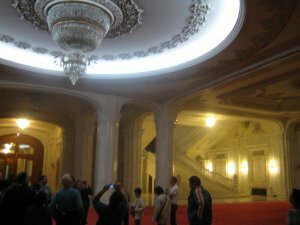 The building contains 480 Chandeliers (requiring 3,500 metric tonnes of crystal) and 1409 ceiling lights. To make all of this work requires 3 million light bulbs. 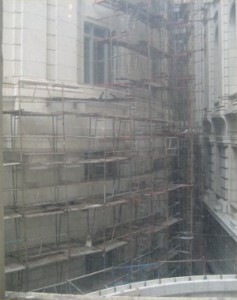 Building work started in 1984 with 20,000 workmen and artisans and 700 architects. The lead architect was only 27 years old, and presently sits on the senate. Our guide demonstrates that the main them of the building is symmetry. 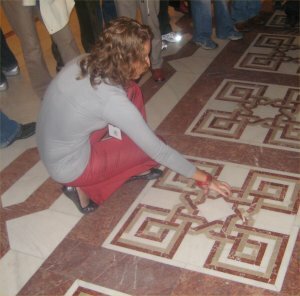 Here, some hand crafted marble tiles have a pattern, which is a map of the actual building. 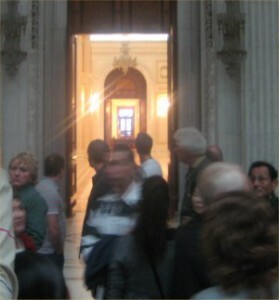 This picture isn’t fantastic, but it shows the symmetry of the building, as all of the doorways line up perfectly. 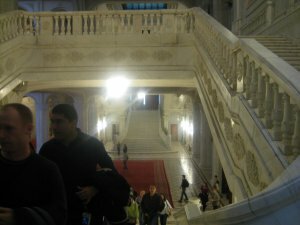 This picture of the staircase shows the quality of the marble and the craftsmanship used to work it. 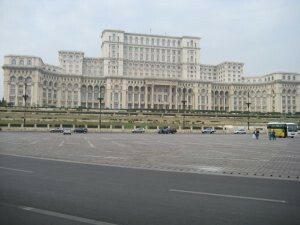 The building uses one million cubic meters of marble from Transylvania. 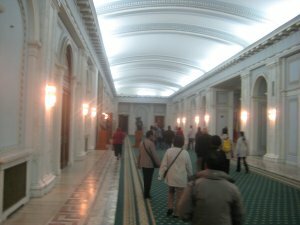 The building was originally intended to serve as headquarters for all the major state institutions (it must take a lot of people to “run” a communist country). 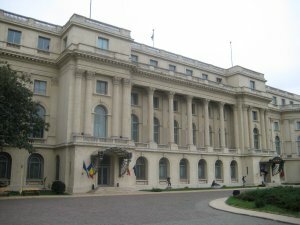 During the 1989 regime change, its leaders referred to the building as the House of Ceauşescu, using it as an example of the excessive luxury in which Ceauşescu would have been living. A stark contrast to the squalor and poverty endured by many people living in the surrounding neighbourhoods. 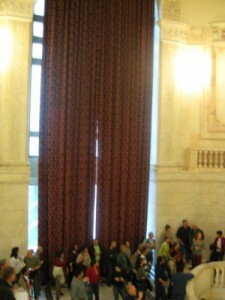 These curtains, for example weigh one metric tonne. Parts of the building (some of the west wing, some of the east wing, parts of the second floor, basement 3 and everything below) are yet to be completed. As we pulled back the curtain (which took some doing) we saw the 5% that remains unfinished. The building was only 80% complete at the time of the revolution, and the controversial decision was made to continue with it (many people thought it should be demolished). 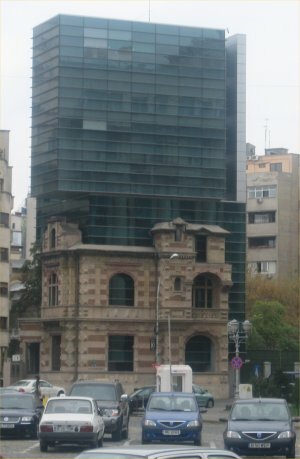 Whatever the original motivation for the building, it’s superb, and I think they were right. Our guide pointed out that every part of the building screams traditional communism, yet no communists have ever occupied it. This is the biggest room, I have ever stood in, in my life. 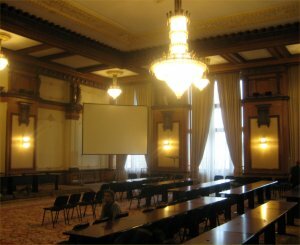 Lets face it, Ceauşescu wanted to rub foreign leaders’ noses in it when they came to visit the building, and I could imagine George Bush and Tony Blair attending a reception in this room and it achieving that aim. Me standing on the balcony. It’s not that I am miserable, I was just blown away by the magnitude and splendour of the building. No political speeches have ever been given from here although Michael Jackson was standing here, when some fans bellow cheered him and he shouted hello Budapest, which is several hundred miles away in a different country (tool !). 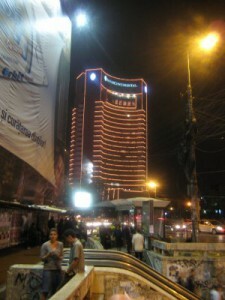 In the background is the Intercontinental Hotel which overlooks the square. I didn’t see inside, but it really is one of the most impressive hotel buildings I have ever seen outside Las Vegas. 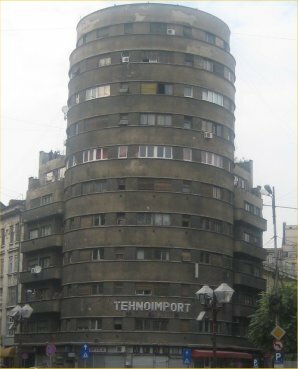 Its also the tallest building in Bucharest. 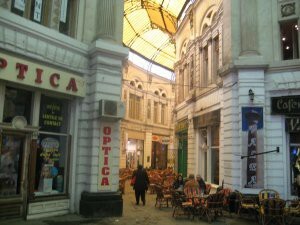 Macca-Vilacrosse are two pedestrian alleys roofed with glass and wrought iron and lined with shops, cafes and restaurants. We had lunch here, it was rather atmospheric, with perhaps an excessive number of begging dogs, children and old women. 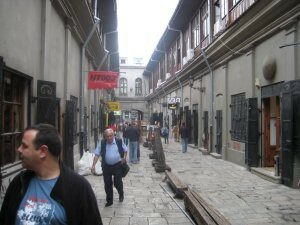 We found this self contained street where antique shops and art galleries were located. Nobody bought anything, but it felt quite cultured to walk through there. 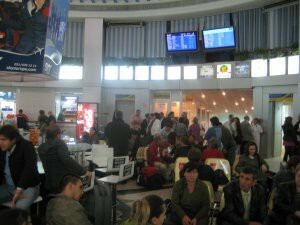 Finally, we head back to our Hotel, get our minibus and arrive at the worst Airport I have ever visited (I am sure it will pick up, as more people fly through it). 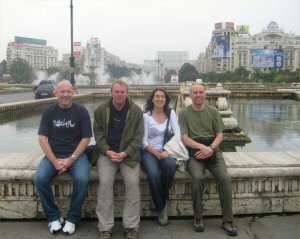 What a brilliant trip, spending special time with a few old friends, and meeting loads of new ones (too many, to mention here). Confidentiality binds me from discussing the details, but without the special assistance of one individual, I would have missed out on this trip. You know who you are, and sincere thanks. 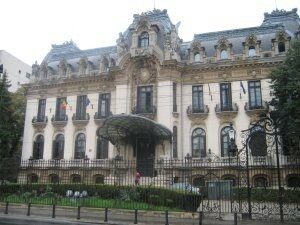 Three days in Bucharest with the India 3 and assorted others (1/2). 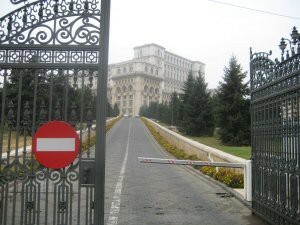 I had read about the largest palace in the world being in Romania (I had imagined it would be in Saudi, or somewhere like that). The crew I met in India and I decided to have a re-union there (unfortunately, the excellent Jane couldn’t make it) and they brought other travellers with them (when I say travellers, they weren’t Gypsies, or anything like that).A great guy on the trip called Sid (his name has been changed to protect his identity) described me as John Sunter, the man that PC forgot. 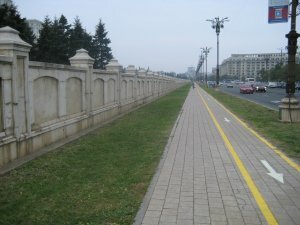 This picture was taken from the bottom of Union Boulevard, you can see the fountains, Dâmboviţa River and Parliament Palace in the background. I was initially surprised at the cost of things in Bucharest, as I expected they would be much cheaper.In reality, although the rest of Romania is extremely poor, Bucharest is a thriving business capital, with commensurate prices.Our hotel was right on Calea Victoriei (Victory Road) considered the most beautiful street in Romania and first built in 1692.The Romanian Athenaeum is a landmark of the capital and opened in 1888.A portion of the construction funds was raised by a public subscription in a 28 year long process, remembered today, by the slogan “Give one lue for the Atheneum”. 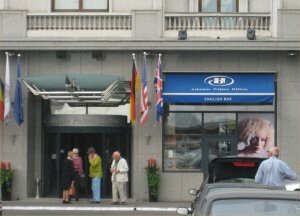 The Athénée Palace hotel has a history of espionage.It may well have been Europe’s most notorious den of spies in the years leading up to World War II, with British agents, as guests alongside members of the Gestapo).In 1948 the hotel was nationalized by the new Communist government, who famously bugged every room, tapped every phone (and every pay phone within half a mile), and staffed the entire hotel with informers.The doormen did surveillance; the housekeeping staff photographed all documents in the guests’ rooms, not to mention a number of the guests had been planted.The government-run Athénée Palace closed in 1994 and was bought at auction by Hilton International, who proceeded to do a $42 million renovation and expansion, reopening the hotel at nearly twice its former size in 1997. 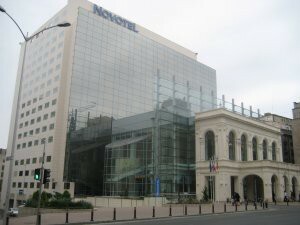 The Novotel, had a clever mix of old and new.The front is a replica of the old Romanian National Theatre in roughly its original location.The “modern” national theatre, is about half a mile away. The Central University Library is a beautifully ornate building located opposite the Royal Palace in the Revolution Square.The library was founded by King Carol I and the building was designed by the French architect Paul Gottereau, who also designed the National Savings Bank (CEC) building.The building was heavily damaged during the December 1989 movement but was later restored.The addition of cars for sale, in front of the building, has ruined the photograph. 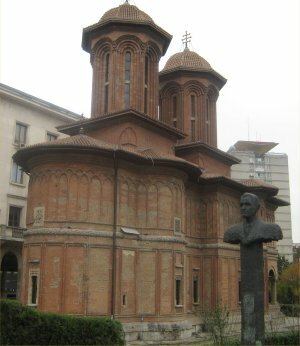 Cretulescu Church (Biserica Cretulescu) on one corner of Piata Revolutiei (Revolution Square), next to the former Royal Palace.This is the beautiful red brick Cretulescu church, one of the oldest churches in Bucharest. This is the balcony where Ceauşescu gave his last speech.He had actually arranged for a crowd to be there and cheer, and looked on helplessly, as the crowd turned on him.The balcony was a lot lower than I remember it on television at the time. 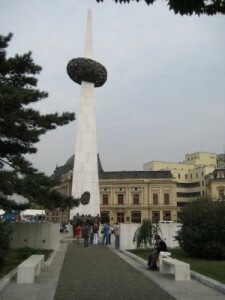 In front of the building, in the newly named revolution square, the rebirth memorial was constructed to commemorate the 1500 people who lost their lives during the revolution.The abstract monument sparked a great deal of controversy when it was unveiled, being dubbed with names such as “the toothpick and the olive”, as many believed that it didn’t symbolize the revolution well enough.The designer, Ghilduş, was an applied artist, previously having experience designing objects like chairs and lamps, rather than a sculptor.Owing to its relative unpopularity, the monument is guarded round-the-clock, but despite this, on the night of 12 May 2006, it was vandalized. The Hotel advised us that they could organise a tour bus for us all (throughout the weekend, the Hotel staff were really helpful, ordering taxis, booking restaurants and stuff like that).It was decided that we would charter the bus, to get our bearings and for only a tenner each, we got a private tour around the city.Our guide spent 3 years in America, his English was excellent. 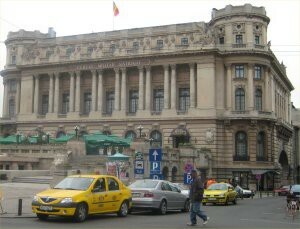 The Army Club (Cercul Militar National).This highly ornate building was designed in French neo-Classical style by Dumitru Maimarolu, Victor Stefanescu and Ernest Doneaud.Construction started in 1911 and ended in 1923 with most of the funds being donated by the Romanian Army officers.The green umbrellas at the front show the location of a fine terrace restaurant, open to the public. We stop briefly to visit the Parliament Palace (the one thing I really wanted to see in Bucharest).On our last day, we actually had a tour of the Palace, but on this occasion just stopped outside to take photo’s.From the distance, between the camera and the tour bus on the right, you can see just how far back you have to be to fit the building onto the picture. 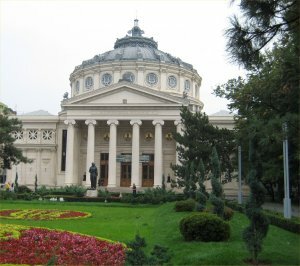 National Art Museum.This imposing building used to be the Royal Palace.Starting with 1948 the palace housed the National Art Museum and it displays an extensive collection of Romanian and European art dating from the 15th to the 20th century.The building was damaged during the events of December 1989 and was closed for several years for repairs. 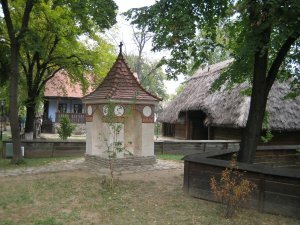 The Village Museum (Muzeul Satului) was established in 1936 and it contains over 300 wooden houses, windmills, churches etc. from all over the country.This museum is one of the largest of its kind in Europe and many of the buildings are originals which were brought here in pieces and reassembled.The oldest houses date as far back as the 1700’s. The buildings are setup like actual villages, and then grouped according to location.This is a Transylvanian Tall house. I found this building, the most fascinating.I cant remember where it was from, but it was actually dug underground, similar to the buildings I have heard of in Coober Peddy, Australia. 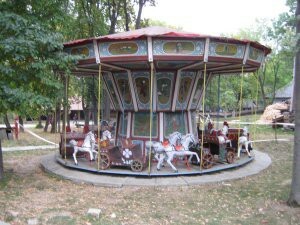 We wandered outside the Village museum and had a look around.I had read that there were some very nostalgic fairgrounds in Bucharest.One of the ones I found looked exactly like a fairground I visited when I was 7. We continued to wander around the park, looking for something to eat/drink.There were distinct Coffee/Beer factions within the group (you can guess which one I was in).Skol hasn’t been sold in the UK for what must be 15 years so I decided to try some.It was stronger than I remember it, but just as awful !.In the background is Claire. It turned out that Claire was a Midwife, it was the first time I had ever met one (well technically the 2nd, but it was the first time I was old enough to speak !). 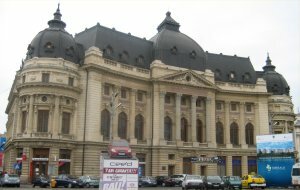 Ion Luca Caragiale Bucharest National Theatre.Half a mile from the original site, and has been in use since 1973. Cantacuzino Palace.Originally designed by the architect I.D.Berindei in French baroque style, construction was started in 1899.Above the main entrance there is a giant shell-shaped porte-cochere; two stone lions guard the entrance.George Enescu – Romania’s national composer – lived here for a period of time.The building belonged to his wife Maria Cantacuzino.Nowadays the palace houses the George Enescu Museum which displays the musicians manuscripts, compositions and personal belongings like one of his first violins. 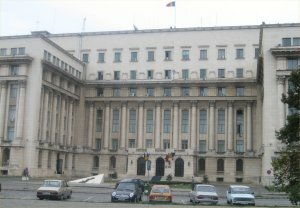 The headquarters of the Architectural association in Romania.Built on the ruins of the State Security Building.The Securitate was, in proportion to Romania’s population, the largest secret police force in the Eastern block. 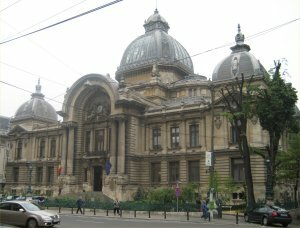 Romanian Savings Bank or CEC Building.This beautiful building was designed in eclectic style by the French architect Paul Gottereau.Its construction began in 1894 on the site of a 16th century monastery Sf. Ioan cel Nou.This was the only bank that was allowed to operate during communist times. 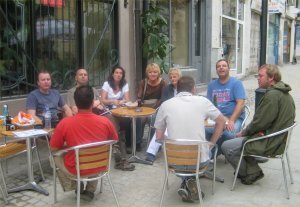 The Coach dropped us outside the National Museum, and we debated going in.We decided instead to wander around the Lipscani district, or old town.Only 1/5th of it, remains, the rest was demolished to build Ceauşescu Peoples Palace, and the administrative and social buildings attached to it.We found a nice bar, and had a few drinks.Afterwards, a few of us went shopping, a few exploring, and another few stayed to watch the Rugby. Lipscani was the main street of the City, for nearly 300 years, and was the inspiration, for people describing Bucharest as the Paris of the East.It’s now a narrow little curly street cut in three parts by Calea Victoriei and Bucharest’s main boulevard.It took it’s name in the old days, as many of the shops in the area used to sell different articles that had been brought from the German town Leipzig (In Romanian: Lipsca). 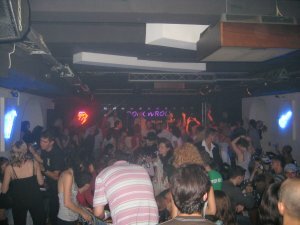 Significant work is being done to rejuvenate and repair the place, and it certainly has charm. As we wander further a field, we come across this building.Against some fairly stiff competition, this was the ugliest building I saw in Romanian.I know that I have been quoted in the past saying you don’t live on the outside of a house, you live on the inside, but no matter how superb, the soft furnishings, I don’t think I could live in this building. In the evening we wandered around University Square, where the main revolution took place.It’s described as vibrant and busy 24 hours a day, and it’s certainly that.It’s reached by an underpass, so you don’t have to cross the road to reach the square.The underpass is the main meeting place within the city, and I was surprised at how comfortable I felt while in there (I normally find such places claustrophobic and unnerving).In the background is the Intercontinental Hotel which overlooks the square.I didn’t see inside, but it really is one of the most impressive hotel buildings I have ever seen outside Las Vegas.It’s also the tallest building in Bucharest. We visit a famous restaurant, just off the square called Burebista Vanatoresc.They specialised in traditional Romanian food.Some of my friends were eating bear (I mean the animal, they didn’t get undressed for the meal !) and stuff like that.I chose royal beef, which turned out to be a mistake.The good news was the mashed potatoes it came with were absolutely delicious.There was a wedding going on inside the restaurant, so the service was a bit “tame”.Overall though, it was a pretty cool evening, and a great chance to meet some of the new people who Angela and Paul had introduced me to. Although not really a nightclub person (most of you know, I used to frequent nightclubs, only as a means to get late drinks, and that is no longer necessary in the UK).I am however, a bit of a reverse snob, and when I saw a “back street” nightclub around the corner that looked sleazy, I decided to pay a visit and a few of the crew came with me.We couldn’t have been more wrong. It was nicely painted, spotlessly clean, had table service, and served cocktails. A live band was playing when we got in there but finished a few minutes later, which was a shame.They played the usual bing-bong 80’s stuff which is popular in eastern Europe.They also played “Winds of Change” by the Scorpions, a song synonymous in both east and west, with the ending of the cold war.